The Vogt Reel House is located on Jefferson Street in Lexington, Kentucky. More commonly referred to as Station #4 in modern times, this fire station is the oldest one still in operation in the city. It was built in 1904 in a neo-Jacobean style, and named for Henry Vogt. Vogt not only donated the land for the fire station, but served as a Chairman of the Fire Committee of the Board of City Councilman at the time it was built. Perhaps more impressive than the station's age, history and even architecture, is the fact that the place is widely accepted as being haunted! 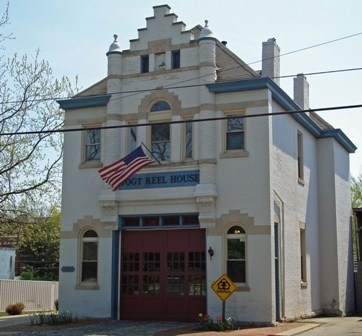 The resident ghost is believed to be the spirit of an elderly fire station employee who passed away in his sleep at the station on December 25, 1945. Henry McDonald, who I confirmed on Ancestry.com, was close to 70 years old when he passed away and is buried in Winchester Cemetery with his wife Lula. However, it seems that although his body may be in another county, his spirit remains at the fire station. Employees routinely hear the distinct sound of heavy boots walking up and down the station's antique iron staircase, only to find no one is there. Captain Jason Wells was introduced to "The Captain" as McDonald is lovingly referred to, when a cold breeze blew through the station out of nowhere, upsetting a stack of papers. Another employee posted on a popular fire fighter message board that the Captain makes his presence known in other ways as well. It seems that McDonald favored a certain cane-bottomed rocking chair. After his death, the chair was moved to the attic, where it can occasionally be heard rocking on its own. Neighbors of the station have even claimed to have SEEN McDonald. Sometimes when the staff is away on a call or on training, a firefighter can be seen standing in an upstairs window of the station. The hauntings are so prevalent that it is said that some employees refuse to be in the station alone, even to pick up their paychecks! This location has recently been featured on a local news station's Mystery Monday segment, and has also been investigated by the Crosstown Kids as a Halloween special. I've also seen it mentioned that the fire station sometimes gives Halloween tours. What I find MOST interesting though is the station's engine. Painted on the side is a skeletal head wearing a fireman's helmet and with the title "The Phantom!"